Looking to eke more velocity out of your 6mm? Hornady’s Super Performance line gives extra oomph to your favorite round without adding pressure, recoil or temperature. 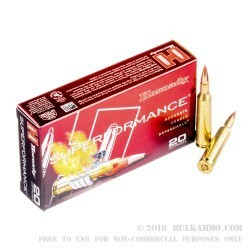 Manufactured with progressive Hornady powders and choice cases and primers, these rounds can deliver an extra 100 to 200 FPS without adding to felt recoil or decreasing consistency. 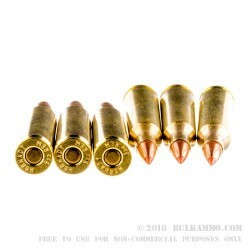 These rounds also feature the SST, or Super Shok Tip, which is a polymer tipped projectile with a boat-tail design for a flatter trajectory. 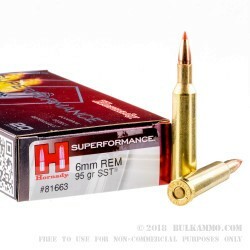 This, in conjunction with their Interlock Ring, makes these 6mm shells have maximal weight retention and expansion after impact, while still being extremely accurate. Loaded with a 95-grain SST projectile, into a noncorrosive, reloadable, boxer-primed brass case, this 6mm is an ideal load for deer and similarly-sized game. 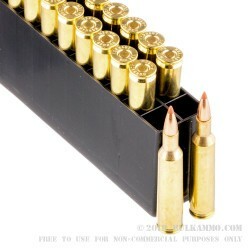 Each box of 6mm from Hornady comes with 20 rounds. Originally an ammunition reloading supplies manufacturer, Hornady has been a quality producer of hunting and sporting ammunition since 1985. They strive to create some of the most accurate and consistent ammunition available and are made here in the USA.